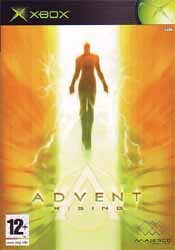 Advent Rising is a third-person, intergalactic action/adventure of truly epic proportions, akin to a fast-paced action movie where the player is swept up in an ever-evolving series of sequences and events. A common legend pervades the galaxy - that of an ancient race that will one day unite the universe. Millions of cultures from vastly distant worlds revere and hallow these mythological beings known as humans. Players assume the role of Gideon Wyeth, a remnant of the last human outpost, who must fight a deadly alien threat, to ensure his species isn't wiped from the intergalactic history books. What should have been one of the finest Xbox games on the market is going to come in for a lot of stick from the gaming press. All the ingredients are here, yet something went terribly wrong along the way- and that is a crying shame, because with a bit of extra care Advent Rising could have been in with a shot of being revered as the best game of all time on the Xbox. The game starts off incredibly promising. As the game opens we are introduced to your character, You Gideon Wyeth, a space pilot, his brother and girlfriend. You are returning from a mission and are told the news that a huge alien space vessel is floating above your world. As you approach the planet you fly alongside the alien craft and you get to grab the controls of your ship as the opening credits play. All you have to do is bring your vessel into land. You then wander around the space station looking for your brother and your girlfriend. This acts as the training section of the game, where you learn how to use your fists, as you get into a bar fight, and how to use your weapons in the firearms training section of the space station. A little later and we are introduced to our villains - an alien race that is planning to kill every last human on your planet. But why do they use a portable scanning device on everyone they come into contact with, before they kill them? Your mission is to get you, your brother and your girlfriend away from this space station as quickly as possible... but that's going to be easier said than done. I wanted to give this game 10/10... I really did. I loved it on so many levels. It's one of the best games I've ever player... and yet, thanks to some really poor presentation, it is also one of the worst. Let's start with the plus points. This is one of the most stylistically impressive games you are ever likely to play. The storyline is gripping, and you actually care about the characters (even though the voice acting isn't fantastic and the cut sequences are not the best, graphically). And the storyline has an interesting twist early on - you have to chose certain actions that have consequences - which I won't spoil here. By far the best element in this game - the one faultless area - is Tommy Tallarico's music. This is hauntingly beautiful - his main theme is one of the best I've ever heard on a console game. And his in game music really helps to add the right atmosphere. Other neat touches include antigravity areas, where you can turn off the gravity in a room for a short time; being able to change to first person mode at the touch of a button. The aiming in standard mode is fairly haphazard (flick the right analogue stick left and right to lock onto a target) so switching to first person view is essential at various stages; and, while you can't randomly hit your own men at the start of the game, it is great to see that you can accidentally kill them while you are attacking the enemy. I also loved the fact that your weapons accuracy and skill level increases as you play - which is an interesting idea. The negative aspects include the fact that, as mentioned earlier, the voice acting and cut sequence graphics are a little poor (the worst example being a crowd of people rushing to the screen where there is just a line of identical women - they hadn't even bothered to change the colour of their clothes or hairstyle) and the subtitles don't run at the same speed as the voices, which is a little odd. Also there are problems with not being able to hear some of the voices on occasion, because of other background noise. The sound volume differs greatly from the cut sequences to the playable section - which means you have to turn the volume up and down constantly. But by far the biggest problem is the games habit of suddenly crashing for no reason - and this happens a little too frequently. Also the graphics in the game have a habit of juddering for no reason - so a ship flying near you will suddenly judder all over the screen and then vanish. While you can roll and dodge, you're very unlikely to actually use these moves during combat. It's much easier to just blast the enemy and then find a medical panel and recharge your heath meter. And, when you get to command a vehicle the controls are rather difficult to get the hang of. Deciding which weapons to pick up and which to leave is difficult as they all look so similar. Oh, and whoever wrote the press release information should be shot. This reveals one of the game's twists - one that, when you discover it, comes as a bit of a shock... unless you've read Majesco's synopsis, that is. In all honesty the presentation is atrocious. What is very nearly one of the best games I've played in recent years, ends up being just quite good. You are strongly advised to rent this before buying. Click on the logo of the desired store below.